The Academy peer learning experience provides an industry-unique way to learn and grow with a select few, like you, across the country. Something special happens when peer discussion and research findings are filtered through the Top-100 health system point of view. The unique perspective provided is critically relevant. Decisions are influenced, thinking is shaped and strategies to accelerate innovation are guided. The Academy Peer Forums and group learning Collaboratives meet twice a year. The facilitated meetings include the latest health system research, peer case studies, highly topical discussions, informative lectures, policy updates and networking events designed for building and nurturing the personal and exclusive peer network you can call on to discuss ideas and share strategies for years to come. 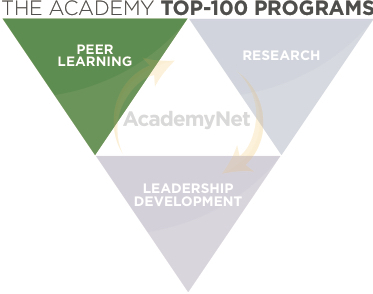 The Academy has exclusive, Top-100, executive-focused peer learning forums. The Academy has issue-focused, multi-disciplinary learning collaboratives for executives and their teams.